Many of the songs we use to celebrate Jesus' birthday have been scooped up by copyright amassers (kinda like what happened to "Happy Birthday To You," hey). Fortunately, the holidaze are an endless well of creativity, and we have been blessed with some wonderful public domain and Creative Commons music. The holiday music featured on FMA encompasses everything from The 8Bits of Christmas to Antique Cylinders. One recent addition is En attendant Noël..., a compilation from @diffuser.net. 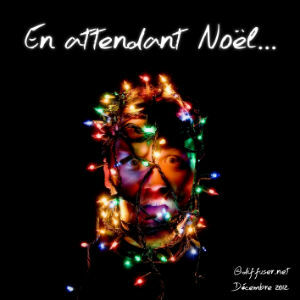 The French netaudio resource (profiled here) has been adding a daily winter holiday song to their compilation and now that the 25th is here we are pleased to share this gift with you! Some are old favorites 'round these parts, many are new favorites, and if they find their way into your holiday plans, you'll find links + licenses below.